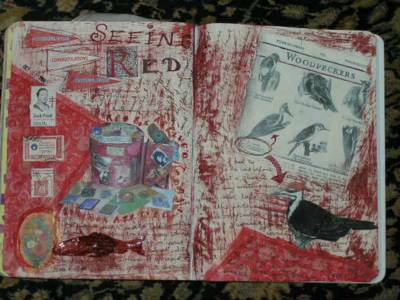 The red box from the Artful Treasures swap arrived. Some of the things that I found that I want to keep are spread in front of it in the picture. Our mail clerk was impressed with this pretty box. Most of the things I used on this page were in the box too. I really like the way the red napkin turned out. This is the first time I've used napkins. I'm sure it won't be the last. 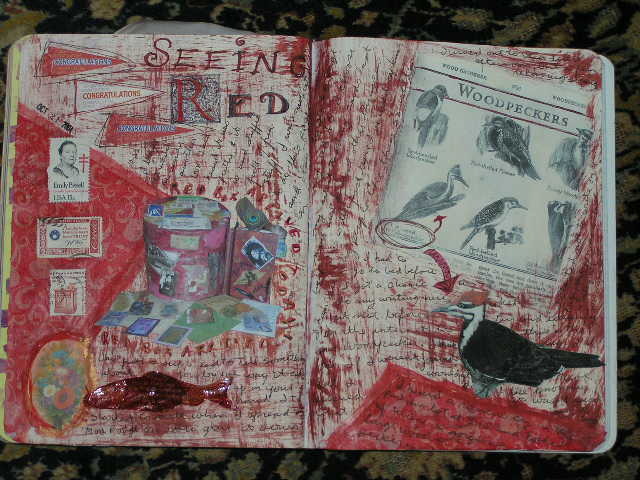 The journaling under the woodpecker reads, "I heard a raucus cry in the parking lot at SHS and looked up to see a large woodpecker." I looked it up later and home and found out what kind it was and printed out the photo for this page. They are awesome birds and it was a treat seeing one.